» Forum » All Pinball » Pins that have been produced with themes too late. » Pins that have been produced with themes too late. Pins that have been produced with themes too late. Another thread from this morning got me thinking. 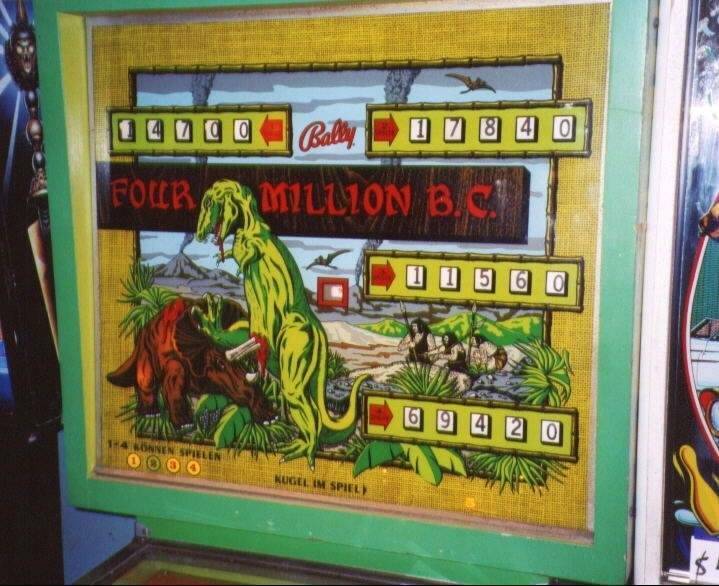 So are there any pinball machines that were made where the themes that were chosen were too late? Did the show stop before the pin was released -- 1990? Rollergames show aired for one season 1989-1990 and the game was released in the summer of 1990, so yes it was a tad too late. Most of the WPC movie licenses? The hobbit was announced to coincide w the movies and finally shipped 4 years later. Johnny Mnemonic movie was released end of May of 1995 and the machine was released early August of the same year, so not all that late. And POTC will come out anyway. An older machine that comes to mind is Eager Beaver. It came out in 1965 w/ production number of around 1300. It's a shame it didn't come out in the early 50's. People around the world were glad WW2 was over, eager to get on with living their lives, enjoying life, raising families, working hard, buying consumer products, playing hard, etc. I was very young at the time, but it seems there were plenty of beavers that were eager in the mid 60s. Even the Bally version was a little too late. Maybe I should have asked which pinball machines were produced with a theme not too late. Twilight Zone. Great show/game and was in syndication at the time but still over three decades late. Nostalgia is different than too late. Jjp ITV is too late. Oy! Most of these themes, if they are true will be too late... Munsters, The Beatles, Toy Story. They’ll still sell, but not in the numbers if they were ‘fresh’. Surprised nobody's mentioned Star Wars yet. Even the Data East version was too late. 50 year anniversary of Thunderbirds was 2015 which is what the original unedited sales flyer alluded to. I'm sure they should be shipping any day now to still cash in on that. JJ POTC because its not nearly as big of a license as it once was. Stern WWE came out too late as the 90s were big for wrestling. JJ WOZ was perfect for nostalgia so i wouldn't call that too late at all. Actually being the first for JJ and the first big screen pin makes a whole lot of sense. Every one of the Stern band-themed machines, with the slightly possible exception of Metallica. You want a Taylor Swift pin ? I think the Sterns band pins currently fall under the nostalgia category, not the too late category. HOWEVER, I think Stern needs a Tom Petty pinball and... because of his very unfortunate death... if they don't have it soon then it will be too late. Nostalgia means longing for the past. Not dwelling in it. I think building $6k - $10k monuments to something that happened 30-40 years ago when it could have been done at that time or any time since then, is more like way too late. I'm going with "wistful affection for the past" as my nostalgia definition. Or, as an example, 50 year old with discretionary money will buy these band pins because it reminds them of great times from their youth --- nostalgia. I agree with you in that, for someone who doesn't give a donkey about the band, these band pins are well past their prime. Batman came out two years after the 1989 movie, but may have been good advertising for the sequel coming out the following year. Would a Madonna, Wham, or Michael Jackson be more to your liking? They were the biggest pop stars of the bygone era some of you seem to like. "Monuments to the Past" would make a sneaky-good band name. It would also make a great sub-forum for new machines on this website. Or a great tagline for Stern: Stern Pinball - Monuments to the Past. The DMD advertises Batman Returns coming to theaters. Not a bad idea, Batman Returns was probably early in production when they started designing DE Batman. Not quite as late as this one. But I do give it credit for inspiring a lot of the band pins of today. They probably got the license cheaper in 1991 than they would have in 1989. WB must have considered it a good promotional tool. 6M$M came out just after the TV show had been canceled. I was a big fan of both the show and pinball, and when I saw the pin I thought "Why'd they make this? That show is gone." Maybe it lived on in reruns in some markets but not where I lived. This was based on the CBS remake. It was still a few years late though. Every stern since at least 2000.